Content marketing has many advantages for SEO, particularly in regards to increasing search engine rankings and website traffic of which sets a content marketing campaign in motion. Our content marketing campaigns are geared around improving search engine rankings, helping a client to appear higher on search engines, whilst beginning to rank for numerous keyword variances and growing the overall online visibility. 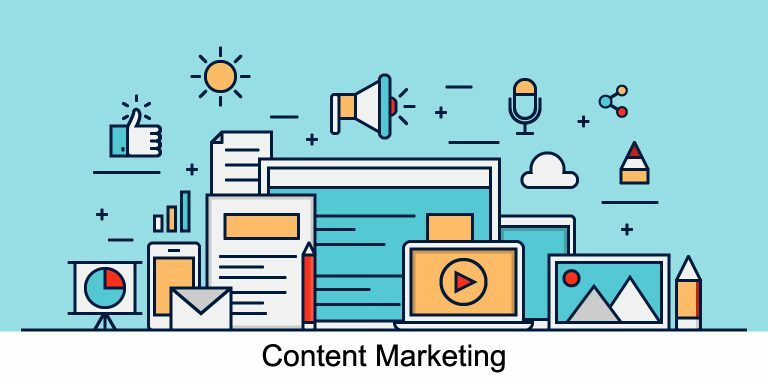 Content marketing is focused around securing links that appear on third party websites and content that is dedicated to ranking for desired key terms. We would devise a content calendar ahead of the project to ensure clear direction. We would begin by initiating research looking at industry, key competitors and their products and services. By taking a closer look at the online market you specialise within, we not only discover who your true competitors are, but also the strategy behind their success. Full research can reveal new content topics and gaps within a particular market that we can tap into. When engineering a content marketing campaign, our first priority would be to conduct an onsite optimisation review of your site to identify and prioritise all issues, which could affect your search engine visibility. This can include issues with duplicate content to your page titles and Meta descriptions not being optimised fully. After the initial review, we would endeavour to undertake continual on-site and technical optimisation creating building blocks for your campaign to succeed and meet marketing objectives. Another key factor that we would take into consideration is the reader. Every site has two audiences and its key to recognize this. Firstly we have our human audience who need their attention capturing and problems solving. We also have to focus on search bots, which have to determine the functionality of the site and relevancy of the content. In order to be successful, we aim to gain respect from both audiences. We would undertake keyword research, assessing what a client wants to rank for and analysing other keyword options, which may present themselves as a more realistic goal, or alternatively look as though they’ve got higher conversion intent. Ensuring that we are targeting the right keywords that are going to deliver you high quality traffic for your business is imperative, thus Peaky Digital provides comprehensive keyword research so that you’re left with a highly targeted campaign that will generate increased visitors to your site along with increased return on investment. Copywriting should be done with a skilled-eye, as keyword stuffing will result in a harsh penalty from Google Panda. Content needs to be rich and of a great standard. With the new Google algorithms, content is more important than ever. A website which does not have sufficient content may struggle, not only with the search engines but also with the customer trying to find out information. Copywriting needs to be written with keywords and shareability in mind, we must ensure that our copywriting fits suitably with the target audience as well as with your brand values and tone of voice. When engineering a content marketing campaign, we would also recommend devising a blog that is kept up-to-date on a weekly basis. We would dedicate time to understand your business to ensure that we are meeting your business and marketing objectives and create content, which not only adheres to this, but also is also relevant to your audience. We will work with you to devise a content plan to ensure that a seamless campaign is created. It’s well established that the number of unique domains linking back to your site has a clear impact when assessing search visibility; so therefore, this is a key area that we would push within the SEO strategy. Content promotion is a valuable source to any SEO strategy as it’s not enough to simply gain links for any website. In order for the most success within the campaign we would aim to acquire backlinks from high authority websites. These would be websites that have a substantial audience, constant stream of valuable and fresh content and significant digital presence. Content promotion is integral to any content marketing strategy and we always ensure that it’s placed at the forefront of any campaign.